This beautiful reversible Rain Cape has hidden magnets underneath the sleeves to protect the garment from blowing in the wind. Monet's art is carefully placed so the lapels and the hood are a perfect match . With the lilies painted from his own pond, Monet steals the gloom of the rain to brighten your day. Reversible 100% polyester fabric with matching travel pouch. One size fits all up through 1X. Imported. This beautiful reversible Rain Cape has hidden magnets underneath the sleeves to protect the garment from blowing in the wind. Klimt's art is carefully placed so the lapels and the hood are a perfect match . Painted during the "Golden Period" in Klimt's career. 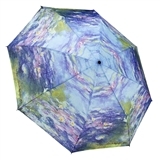 Monet's life's passion beautifully reproduced on this quality umbrella. The painting shows rows of irises in various shades of purple and pink with trees and flowers under dappled light showing off the garden's many colors. Monet's garden was his real life painting that is captured in this wonderful work. 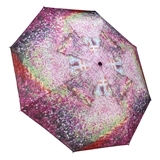 Click-to-open, Click-to-close folding umbrella is 100% polyester, measures 42" diameter open. The painting shows the tender moment between a man (rumored to be the artist himself) and woman in beautiful golden colors upon a patch of a flowery meadow. Klimt's "The Kiss" was his most famous work that is beautifully captured on this quality umbrella. This beautiful reversible Rain Cape has hidden magnets underneath the sleeves to protect the garment from blowing in the wind. Monet's art is carefully placed so the lapels and the hood are a perfect match . The painting shows rows of irises in various shades of purple and pink with trees and flowers under dappled light showing off the garden's many colors. Wearing this cape will brighten on the rainiest of days. Monet's life's work beautifully reproduced on this quality umbrella. With the lilies painted from his own pond, Monet steals the gloom of the rain to brighten your day with this classic rendition of the great artist's work. Our popular umbrella is back in fashion forward pink blush! There will be a spring in your step on rainy days when you use this fashion forward music themed umbrella featuring white sheet music on a pink blush background. A high-quality walking umbrella with wood handle, fabric top, click-to-open mechanism, metal ribs and fabric sleeve. A generous 40" diameter when open. 35" long as a walking cane. Adorned with Degas' impressionist ballerinas, this youth size rain umbrella doubles as a ladies' parasol, offering a bit of shade at outside concerts and recitals. 25" long, 27" diameter open. Endless rows of piano keys to make cloudy skies seem sunny. Click-to-open umbrella measures 37" in diameter open, 15 1/2" long when closed. You might just find yourself singing and dancing in the rain underneath this inspiring umbrella, but we don't recommend attempting any pirouettes in a downpour. You'll look forward to rainy days so you can use this white music-themed umbrella.